Just because the ground is frozen and you can see your breath on the frigid outside air, doesn’t mean it’s too early to begin thinking about spring planting. Starting these seeds indoors will help encourage a strong, healthy plant when it’s time to move them outside. Grow your own indoor garden today to get a jump on the season and expand your gardening repertoire. Keep in mind; seed starting is not an easy process. It will undoubtedly take patience and some trial and error to master your indoor environment. However, the results are well worth the time and effort, and once you get the hang of sowing seedlings indoors, your garden is sure to flourish. It is especially important to start seeds early if you live in a region with a short growing season that would hamper growth. Starting seeds indoors saves money as it is much cheaper to buy seeds than full-grown plants. You have more options when it comes to color, variety, and type of plant. These options give you the freedom to experiment and try new things. If you are an organic gardener, you can ensure that your plants are raised without pesticides or other harsh agents. Vegetables are the most common type of plant started indoors. These plants are all hardy enough for transplant and will give a more bountiful harvest if they have a few weeks to grow before spring planting. Most flowers are successful when they are sown directly into the garden following the last danger of frost. However, there are a few delicate flowers that need a little more care and attention before being exposed to the elements. This list is a general guide of flowers that do best when started indoors. The primary concern that you need to assess is what type of soil to start your seeds in. The easy solution is to buy a premixed seed starting soil which you can find at most nurseries or gardening centers. The ideal mixture for seedlings is equal parts vermiculite, perlite, and peat moss. However, you can feel free to adjust this ratio, or simply combine ⅓ potting soil and ⅔ peat moss for a more simple alternative. One of the biggest concerns when it comes to indoor sowing is light requirements. Once seedlings have sprouted, they need around 14 hours of direct sunlight per day. The easiest solution is to install an artificial grow light. That way, you can place your seed trays in an area away from the windows. Place the lights as close to the seedlings as possible and be sure to move the light up as they grow. Turn the trays at least once per day to prevent leggy growth. 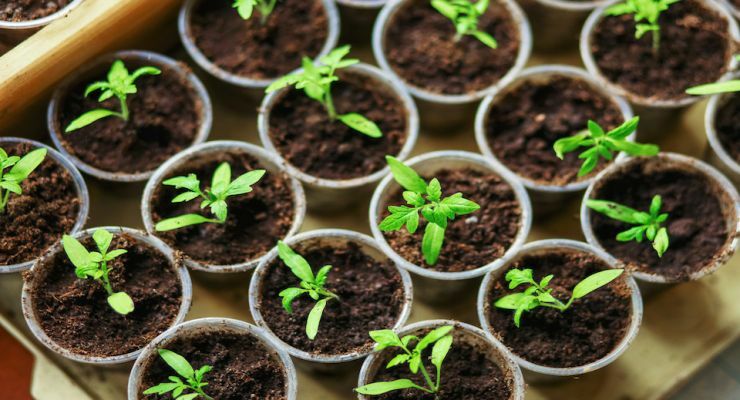 It is important to cultivate a warm, moist environment for your seeds, but this can be particularly difficult if you are growing them near windows or in a drafty basement. Though different plants have varying temperature requirements, a soil temperature of 60-75 degrees Fahrenheit is ideal for most seedlings. Always check seed packets for growing information to be sure, but this temperature is a good rule of thumb. If you are planting in an unheated greenhouse in the wintertime, invest in heated growing mats or a heating system. It can be difficult to know when to start your seedlings indoors. Refer to the information on the seed packet for each plant and create a planting calendar to keep you on track. Looking at the seed packet will also help you determine planting depth and germination requirements. Finding the balance between drowning and drying out your seeds can be frustrating. It is helpful to start with a spray bottle and a light mist to keep the soil moist but not drenched. Of course, with this method, you will have to water more frequently and keep an eye on the soil moisture levels, but it is ideal over drenching the soil and causing mold and fungus growth. Once seedlings have sprouted, it is best to water more deeply since moisture needs will be higher as the plants grow. Keep in mind that it is okay to let the plants wilt just a little before watering to help harden the roots and prepare your plant babies for life outdoors. Hey Buddy!, I found this information for you: "25 Seeds You Should Be Starting Now and Tips for Success". Here is the website link: https://www.tropicalhealth.com/seeds-starting-now-tips-success/. Thank you.